Hi, I can't seem to link to the world map. to submit data. It Says 'Error! Geiger Counter not found'. My GMC320+ is connected with USB to my computer which is running GQ GMC Data Logger STD V5.52. The Activity is showing on the computer screen. I'd love to put my data on the map. How can I troubleshoot this ? The 123456 is your GMCmap.com account number. 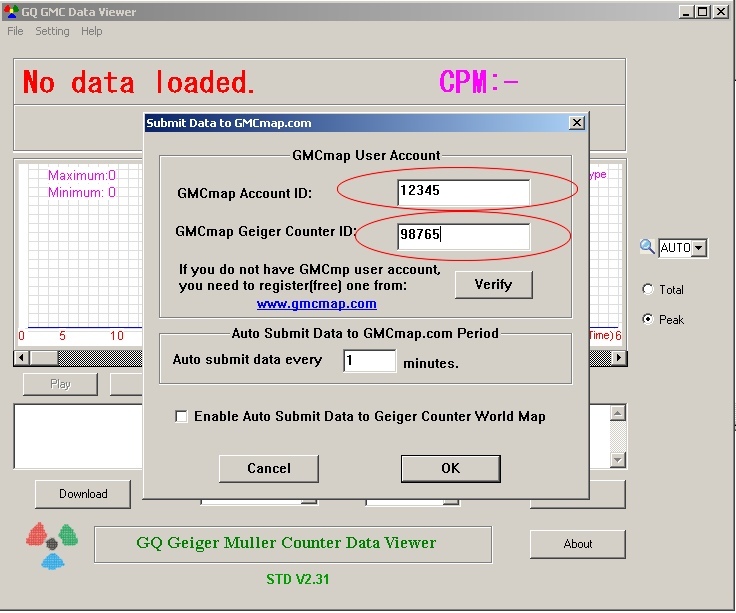 Th 98765 is your Geiger Counter ID in GMCmap.com. Click on the Vrify button to confirm those settings are correct. If not, login to your GMCmap to find out those values. Thank you very much for your help. I'm now contributing to the map I think... I can't see the map for some reason on my computer. I just see a list on international flags. I'm running Windows 7. Use different browser. Like Firefox.